Niche, the leading platform for researching U.S. schools, neighborhoods, and companies, has released its 2019 Best Schools rankings. These rankings analyze 83,542 public schools, 3,903 private schools, and 10,758 school districts nationwide. It has named Cincinnati Hills Christian Academy as the Best Christian High School in Ohio. In its fifth year, Niche's school rankings included more than 700 newly ranked private schools and 5,000 newly ranked public schools and grew its coverage from 55 metro areas to 150. As in past years, Niche's Best Schools rankings analyzed U.S. Department of Education data, supplemental data collected directly from more than 4,000 schools, and millions of student and parent reviews across factors like academics, teachers, and safety. 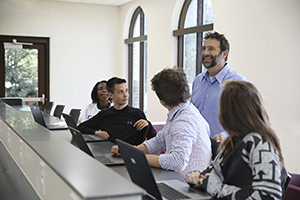 As Cincinnati's only Christ-centered six-year college preparatory high school, CHCA's Upper School features authentic learning experiences such as Entrepreneurial Studies, Independent Research, Senior Capstone Initiatives, and studying abroad - while providing students the foundation for a Christ-centered worldview. Students have the opportunities to take college courses, pursue passions via independent studies, grow entrepreneurship skills, and cultivate curiosity in all subjects. CHCA is also the only school in the region to offer Intersession, a two-week term where students explore a passion, participate in an internship, travel internationally, or learn through service immersion. "Students own their faith through weekly chapels, daily intellectual inquiry in the classroom, and student-led outreach. From state-of-the-art facilities to regionally acclaimed fine arts and winning sports programs, CHCA fully engages students at all grade levels," shared Randy Brunk, CHCA's Head of School. "Our aim is to provide families with the most important information to help guide their school search," said Luke Skurman, Niche's CEO. "Adding significantly more metro areas to our search tool and even more schools to our rankings is just another way that we're building out our nationwide coverage." Read more about Niche's assessment of the #1 in Best Christian High Schools in Ohio here.